I love America. I always have, ever since my first trip there in 1990 for the US Open in California. My mate ‘Swami’ and I went to Disneyland and rode Space Mountain. Our senses were being bludgeoned; everything was bigger, louder and faster. From looping freeways, to donuts for breakfast, it was excess personified. We’d gone from Chester Hill and Budgewoi to another Universe. Years later I moved there for real. Living in Boulder, Colorado. I was so immersed in tennis that I lived in a bubble, amongst Uncle Sam and Apple pie, another American pastime was looming, the NFL. More specifically, the Denver Broncos. They kept popping up. On t-shirts, bumper stickers and billboards. In coffee shops people would ask me “Did you see the game on Sunday?” “How about that John Elway” My curiosity was stirred. I grew up on Rugby League, Soccer and Tennis. I knew nothing of the NFL. My coach Rich and his family were big Broncos fans. I started to watch games in his living room. I’d ask, “What is a down?” I was slowly learning. I went out and bought an Elway jersey, their legendary Quarterback. I’d wear it at tennis tournaments, on flights. I’d be in the countryside, in the middle of Japan cruising around in a Broncos Jersey. I was hooked. I started reading up on the history of the Broncos, how back in the 80’s; with Elway leading they made it to 3 Super Bowls, losing them all. By the mid 90’s Elway was ageing; his window for winning the big one was closing. I’d moved back to Sydney by now but still cruised around in my Broncos jersey. In ’97 Denver made it back to the Super Bowl, this time they won, with Elway outduelling Brett Favre’s Green Bay Packers. They backed it up the following year winning another Super Bowl over the Atlanta Falcons. Elway got his dream ending and retired. They’ve been in the Super Bowl wilderness ever since, until Peyton Manning came to town. Two years ago I went back to Boulder, visiting Coach Rich during the NFL season. Due to his wonderful generosity he scored me a ticket to see my beloved Broncos play the Kansas City Chiefs at the new Mile High Stadium. In all these years I’d never seen a game live. I was beyond excited. 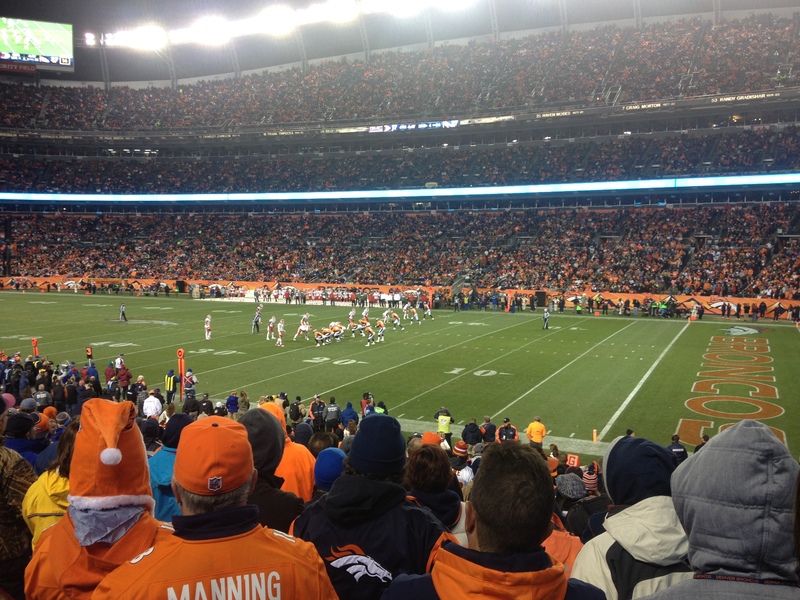 So, on this cold November night with Richs’ family we drove to Denver. As we got closer to the stadium I got a sense of just how massive it is, tonight it will be a full house, 77,000. 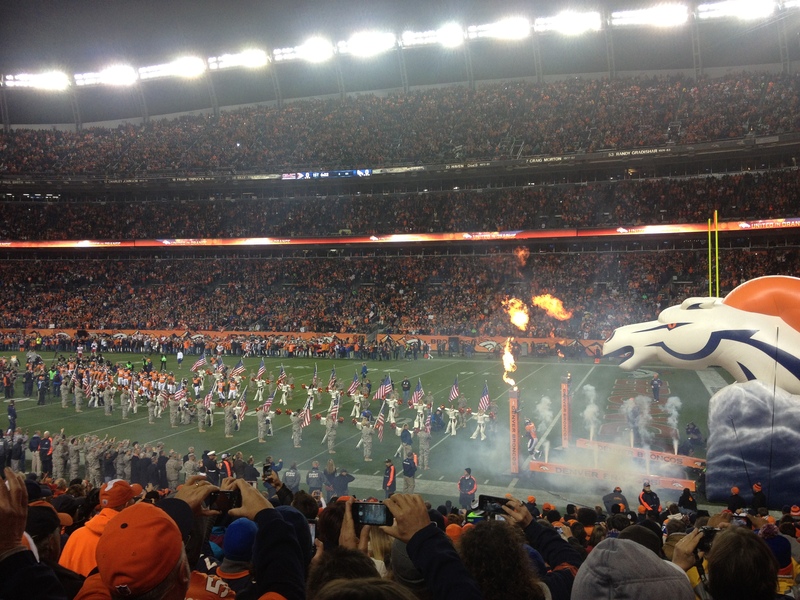 The Broncos have sold-out every home game since 1970. The car park is full of fans ‘tailgating’; they’ve been there all day, barbequing and enjoying the local beer, ‘Coors’. Out the front of the stadium a live brass band is playing, fans everywhere, covered in the Bronco Orange. Once we pass through heavy security we arrive at the Concourse and worm our way through the crowd, past the hot-dog and pretzel vendors. We find our seats and again the enormity of it hits me. It’s a sea of people. There are fireworks, the National Anthem, Cheerleaders, flames, and an actual bronco galloping around, every game here is a Grand Final. The fans are so much fun, we high-five each other when the Broncos make a play. 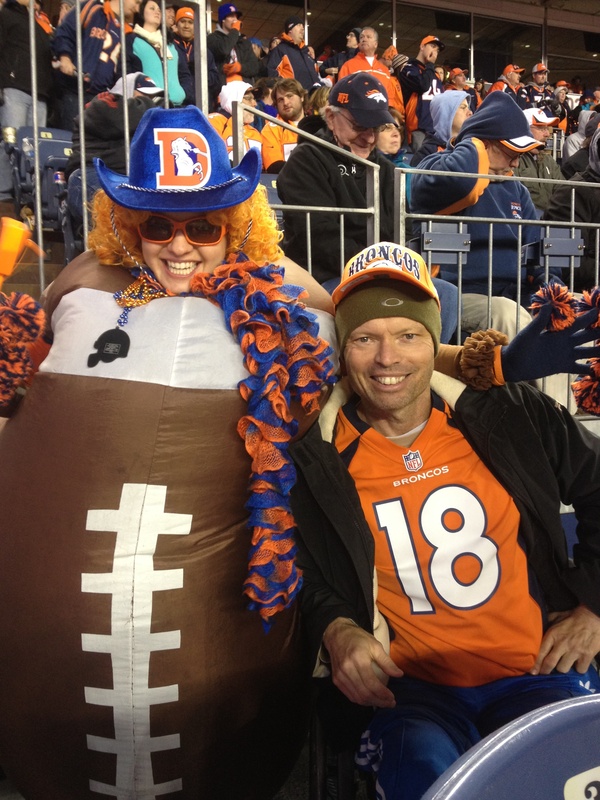 One fan is dressed as a football; another is carrying a Grave Stone indicating Denver will kill Kansas City’s perfect record this season. It’s a wild scene and getting wilder as Denver is winning. The noise is deafening. When the Chiefs have the ball it’s a tsunami of noise, you could actually feel the stadium shake. In the end the Broncos win 27-17, with Peyton Manning throwing for 323 yards. It’s a perfect end to a perfect experience. Today, Australia’s curiosity is peaked with the NFL as we engage in Jarryd Hayne’s journey with the San Francisco 49ers. I’ve been to The Star Casino in Sydney the last three years for the Super Bowl Party and its been packed. My advice is pick a team, watch some games and if you ever get to America and see your team live you’ll never forget it. I’ve still got that Elway jersey, hanging in my closet; right next to my new jersey, the one that says Manning.